Tele.S.Therion is a self-described acousmatic black metal ensemble based in Italy, with members from various European countries. 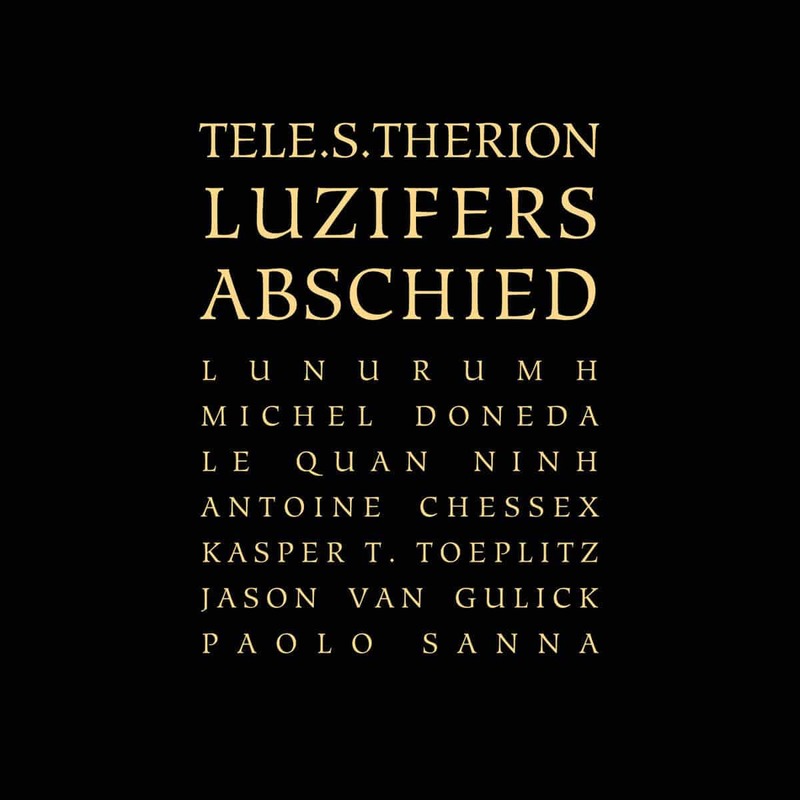 They have been making music since at least 2009, and Luzifers Abschied is their eighth and latest release, from 2017. So… what is acousmatic black metal about, exactly? Simply put, it’s a “veiled” collective improvisation. The band refers to how Pythagorus would give lessons behind a veil, so his students would better concentrate, but I find the analogy here to be questionable, at best. How Tele.S.Therion operates is that each musician will add their improvised performance to a recording of the electric bass session, without knowing what any of the other musicians will play. The result is a poly-improvisation session based on only one score that everybody listened to. This leads us to the actual music of Luzifers Abschied. Even though there is mention of black metal in their self-proclaimed genre, it is practically inexistent, safe for the harsh vocals that punctuate this album. The result is more akin to dark ambient with vocals, or noise music, and I would sooner classify this as an avant-garde classical or jazz piece of music than I would metal. The simple reason behind this is that there really isn’t that much in terms of “metal”, except for the aforementioned vocal delivery. The ultimate choice of either being classical or jazz depends solely on whether or not the musicians based their performance on some kind of score or not, and the information about this album isn’t abundantly clear on that matter. Whatever may be the case, the sonic aura of Luzifers Abschied is dark and mystical. I guess this is quite fitting, since it is based on Karlheinz Stockhausen’s piece of the same name, which is the fourth scene of his opera Samstag aus Licht. The result is a very welcome addition to anyone looking for anything eves remotely “metal”. I found the experience quite engrossing and interesting in its own right, giving bleakness form and shape. It certainly opens the door for new interpretations of that sort of poly-improvised material, or acousmatic music, as they say. For one, I’d like to hear something that is closer to actual metal! However, as it stands, Luzifers Abschied is a unique musical approach that deserves attention and should export itself to new brains.